Helen P. Gay Rocky Mount Historic Train Station, Rocky Mount, North Carolina. Photo: Frank Whatley. Rocky Mount Station — actually named the Helen P. Gay Rocky Mount Historic Train Station — was originally built and opened in 1893. Over the years, the station has been part of the Wilmington and Weldon Railroad, the Atlantic Coast Line Railroad, Seaboard Air Line Railroad, and the Seaboard Coast Line Railroad. Rebuilding modified the Rocky Mount Station from 1911 to 1912, more in 1916, and again in 1997-2000. In the last round of rebuilding, restoration included changing the design to reflect its history. 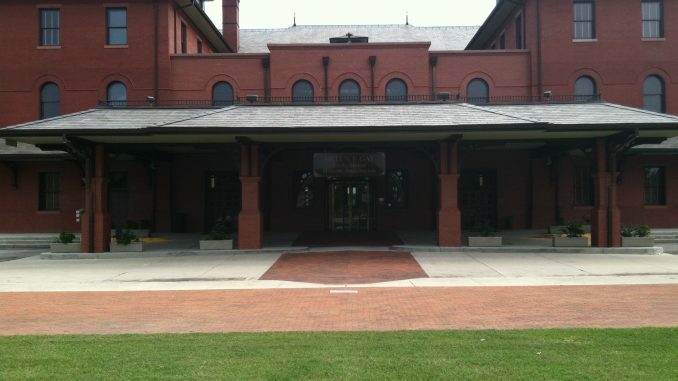 Owned by The City of Rocky Mount, the station today is officially the Rocky Mount Amtrak Station. Passengers can catch a train in Rocky Mount and travel across the state or all along the Eastern Seaboard. To visit the station, head for downtown Rocky Mount and follow the train tracks or Amtrak signs to 101 Hammond Street, Rocky Mount, North Carolina. You might also be interested in The Rocky Mount Railroad Museum project, with railroad history and project milestones available at rmrailroad.org. To find out more about train service through Rocky Mount Station (RMT), visit the Amtrak website.